No feminist academic journey is complete without a sound understanding of economic theory. Failing that, I read Nudge, a pop economics book about the role of libertarian paternalism and choice architecture in government. 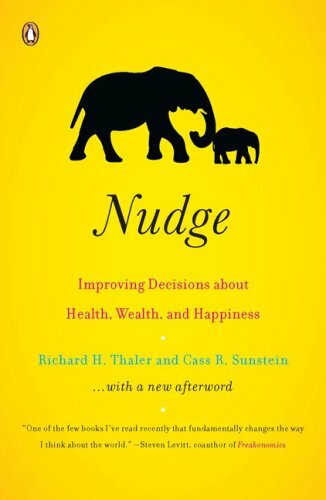 Written by Richard Sunstein and Cass Thaler, two American economists, Nudge refers to the fallibility of being human in a capitalist economy and democratic society. They challenge traditional economic theory by treating people not as completely rational “econs” but irrational, imperfect creatures often ruled by inertia, confusion or impulsiveness. Libertarian paternalism is a somewhat bipolar political ideology, espoused by theorists that believe you can “nudge” people to choose what’s good for them, while still maintaining freedom of choice. Choice Architecture is the art of designing these choices so that people are encouraged to choose what’s best for them, as determined by experts in the field. Scenarios in which choice architecture may be applicable include choosing a pension plan, becoming an organ donor or voting in political elections. If an individual is given too much choice and is lacking in expertise, they are typically overwhelmed by information and end up making a choice that is as bad as making one at random. On the other hand, if an individual is given no choice whatsoever, then they would be living in a totalitarian state (depending on context, of course). It would seem that guided choices, subject to regulations and transparency measures, may be the way forward. And indeed, David Cameron reportedly included the book on his shadow frontbench team’s list of required reading. Thaler has been advisor to the Conservative “Behavioural Insight Team” or “Nudge Unit”, while Sunstein has been advising American president Barack Obama. Nudge is, for the laywoman, accessible and entertaining. The authors never assume that the reader understands even simple economic concepts, such as ‘stocks’ (which I didn’t). Even better; for the first time, I now understand what stocks are. The postscript added to the book even makes me hopeful that I may finally be coming close to vaguely comprehending what the term “2008 economic crisis” means (apart from boarded-up shops and really expensive food). Reading this book is like sitting down and having one of your parents explain an aspect of the world to you, with lots of hopeful theories about improving society thrown in. For the first time in a long time, I felt like governments might be able to achieve something good. Watching Prime Minister’s Questions is enough to exterminate anyone’s faith in the efficacy of modern democracy, entertaining as it is. Overgrown Oxbridge graduates jeering and catcalling each other, overseen by a judge-like Speaker who constantly berates the rabble, is enough to make a would-be voter walk past the ballot box without a second thought. Public opinion is generally equally unfavourable towards both British main parties: the Conservatives are greedy, out-of-touch toffs who don’t care about anything but protecting their own inherited wealth and privilege. Labour are envy-ridden, hand-wringing Northerners who are incapable of planning policy for the long-haul. Belief in political change is undermined by the four-year terms in which a party, once elected, is awarded power; any effective policies will almost certainly be scrapped by the next government in a bid to create attractive mirages that will please voters (rail fare caps, free school meals) but solve nothing, eager to prove the incompetence of the previous party. My interest in politics is only nascent but so far the picture has not proved any brighter than this. I didn’t think it really worth mentioning the liberal democrats. Nudge takes a giant leap over the politician-hating public to point out that those in power are probably trying to do a good job. The authors seem to offer a path through the maze of inter-party squabbles: no wonder they are so popular with current government, who are under ever-increasing pressure from the social media mob to do something about rising unemployment, skyrocketing house-prices and threats from religious extremism. Libertarian paternalism may not be the answer to all social ills but it at least provides an optimistic stab at a solution.